The TEDx Program is designed to help communities, organisations and individuals to spark conversation and connection through local TED-like experiences; TEDx events – often with a live presenters and TED Talks videos – are inspirational, prestigious to speak at and well regarded internationally. Victoria’s doctorate research is focused on developing technology to help people with autism overcome their reading difficulties. She has been using eye tracking technology extensively with adults on the autism spectrum. “I’ve found that readers with autism tend to spend longer looking at images when they are inserted into a text document compared to the control group, and also that adults with autism search for information on webpages in a different way,” said Victoria. “We think that if we are able to augment the text document or the web page in a way that readers with autism could focus better on what is relevant to their search, we would be able to improve their access to information and to its meaning. 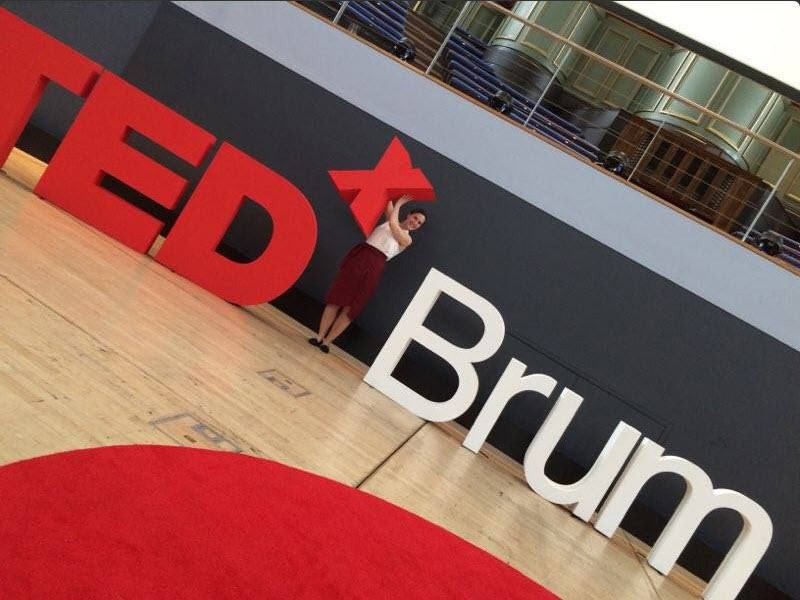 “I looked for upcoming TEDx events in the UK and saw the PowerofUs one in Birmingham. I really wanted to give a TEDx talk in Birmingham as all of the data collection from people with autism was conducted in the city, with the help of local charities and the community. I sent a speaker application form, got invited for an interview and was selected. “There was an audience of 800 people – these were all people who’d bought tickets for the event, so it was a really miscellaneous crowd of ‘thinkers, makers and doers’. Victoria received lots of positive feedback after her talk, from specialists and people with autism. “There were lots of live tweets from the audience. People seemed to have taken home the closing line – ‘True accessibility in the 21st century is not merely about having access to information. It’s about having access to its meaning’ – or at least this is what most of the tweets were about,” added Victoria. RGCL is well known for its high level research with strong international and inter-sector collaboration, and is renowned for its innovative Natural Language Processing (NLP) research and development of various NLP tools and resources. Its mission is to produce world-leading research, to offer first-class research supervision and postgraduate teaching in the interdisciplinary areas of information and language processing, and to deliver cutting-edge practical applications with far-reaching societal impact. The Research Group is about to submit a project proposal to the Economic and Social Research Council for a potential 30 month project to further develop the eye tracking technology. “From the exposure TEDx gave us, we are also now in touch with The Prince’s Trust who we are working with to embed the use of this technology in their provision to youngsters in Birmingham. So many exciting opportunities lie ahead. We also would like to see this technology embedded eventually here at the University to establish the organisation as a leading light in improving societal inclusion for both students and staff,” said Iain. This entry was posted in news, Uncategorized on July 25, 2016 by riilp.